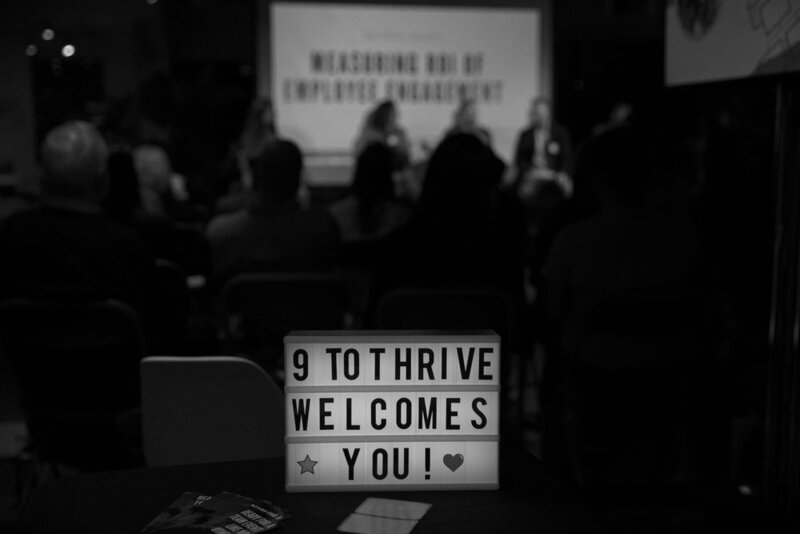 In November, the 9 to Thrive team hosted a panel of HR leaders to discuss one of the most difficult questions to answer in people management-how do you measure the ROI of employee engagement? As forward-thinking people leaders, we’ve read the studies. We know that employee engagement is vital to helping attract and retain the right talent to drive growth for the business. But how do we quantify this? We know that data-driven insights are vital across every industry. So how do we get data-driven with something so complex and difficult to measure like how engaged our workplace is. To help answer this, we turned to our panel of HR leaders: Rob Catalano from WorkTango, Alisha Patel from TWG, Travis Dutka from 360insights and Josh Siegal most recently VP of Talent and Culture at Real Matters. Why is this a discussion talent professionals need to have today? At 9 to Thrive, we like to think about employee engagement as the degree to which employees think and act like owners. Employee engagement is more than just participation in events or how friendly people are around the office- engagement is something to watch because it drives performance. Organizations with an engaged workforce outperform their competition by 202% (Dale Carnigie), have a higher earning per share (EPS) and recover more quickly after recessions and financial setbacks. Engaged employees look at the whole of the company and understand their purpose, where, and how they fit in- they make better decisions. So, following this logic- you agree that engaged teams are a competitive advantage-but how do you keep a pulse on this? How can you know how engaged or disengaged your team is? If you’re asking yourself the same question- and coming up short…don’t worry, you’re not alone! At our event, we polled attendees and as you’ll see below- the two biggest challenges HR professionals have is knowing how to measure employee engagement and how to translate any of these metrics into business insights. What Metrics Matter for Measuring Employee Engagement? With employee engagement- there is no one way to metric to rule them all. No two organizations are the same, so metrics for measuring engagement won’t be either. Measuring your employee engagement depends on your company, industry and ultimately what you have available to you. Why is it significant to measure? eNPS measures employee loyalty, and employee loyalty is the lifeline of your organization. Similar to NPS which you might have heard of for technologies like Netflix, it is the measure to which users of the technology actually like it enough to recommend it. So using eNPS, it’s a way for you to survey your team with one question, “On a scale of 0-10, how likely are you to recommend this company as a place to work?” The responses are more than just a number though, it reflects how employers are doing when it comes to cultivating a healthy workforce. If you team is happy and engaged, they’d want to recommend their workplace as a place to work. This is a win-win because if you’re trying to attract great talent, you want your team to be part of bringing in those great referrals. For Rob Catalano, CEO of WorkTango, eNPS it’s an effective measurement device because it is ,“simple, measurable, trendable over time.”. Why is this Significant? Surveys are a discrete way for your team to voice concerns and give feedback. It can also help to give more insight into pain points for engagement that a simple question alone may not be able to do. The best employee surveys not only provide feedback, but use specific trends to influence business decisions. Use a software. WorkTango is a great option for giving real time feedback and pairing it with actionable insights for execs and management. If you’re considering a technology option- check out this resource for activating your employee voice for your organization. Why is this significant to measure? It helps to put in perspective how much your team cares to contribute. Are they showing up to events? Do they care enough to give feedback and contribute to surveys or meetings? This can be another measurement of employee engagement. How can you measure it? Look at participation on surveys, attendance at team events or all- hands and track it over time. How many people out of your total team are showing up and contributing. This can help put into context all of the feedback and data you’re receiving if it’s only reflective of a small population of the workplace. Why is it significant to measure? Working towards the same common goal makes every team more successful. It helps put into perspective the value of how your HR team contributes to the business as a whole and vice versa. If you’re trying to help your execs understand the value of an engaged workforce, align with senior leaders and work to agree on a common language and common metrics for organizational initiatives. Align on what you want to see and how you’ll accomplish it. How to do it? Josh Siegal one of our panelists, recommends spend time working in the business, shadowing different roles in the business and understand what they do, how they do it and the metrics that drive their decision making. Why is this significant to measure? According to our panelist, Alisha Patel from TWG, “Employees need to understand how they’re doing, why and what they do to contribute and grow doing what they love for the company they believe in.” If your employees feel invested in and see a future with your company, they’re more likely to make better decisions and employee engagement will improve as well. This is a way to help ingrain the spirit of investing in your team and fostering engagement from day one. Now that you have a few more ways to measure and track your team’s engagement- what do you do with them? How Do You Translate These Metrics Into Actionable Insights? Change does need to come from the top down. One way to help execs understand the significance of employee engagement and the importance of measuring employee engagement is to start with what’s at risk. What would an disengaged team cost them? Put that in the context of your organization- what is your cost of turnover, what are you paying in recruitment fee? Once you have these numbers, translate these risks into opportunities. Here’s a great resource for calculating these potential costs of disengagement. Based on the different ways of collecting employee engagement analytics, try to notice trends. Look for outliers and patterns and connect them to what matters to the business and your execs. . Try to connect your employee engagement strategy to business goals and give a plan for how you can get there (X employee engagement metrics with Y business results), for example- if we don’t hire more people this year, we won’t be able to complete that project for our biggest account expansion. 360insights is a great example of a company that has implemented a scorecard- the “Culture Index”. Travis Dutka, one of our panelist spoke to this great concept. At 360insights, they work to align as a company and boil down an overall success metric to a single number, a report card grade of sorts. How did they do this? They chose numbers to reflect company goals and are working to find the right combination of numbers and weighting to help them understand overall success/company health. This is broken down by company as well as by department and meant to be a conversation for the executive team in their meetings as well as the leaders with their teams. So, you’ve got the tools for measuring, you know how to translate this into actionable insights for the company and your execs…but now what? It’s time to make it a practice and routine to help it stick. Start NOW. Establish benchmarks - There is no better time to start than right now. Use where you’re at today as a benchmark and track regularly from there. Best practice is at least quarterly. Get a seat at the table with your execs- To impact real change, it’s important to align with the executive team and help them understand the impact of your work in measuring and improvement employee engagement has on the company. As an HR leader, ask to sit in on business planning meetings and even hold your own regular meetings and check-ins with your execs and key stakeholders to discuss employee engagement. Understand your business, all aspects of it- No department exists in a vacuum, especially not HR or Talent. Try to integrate yourself in various departments and aspects of the business to understand what they do and what matters to them. It will help to give context to all feedback and will improve alignment. Get feedback, fairly and frequently. - Annual surveys aren’t an accurate picture of how your team is doing daily. Try your best to measure on as regular of a cadence as you can to get feedback when it is fresh and matters most. Now over to you! Are you currently measuring employee engagement? We’d love to hear from you, leave a comment below.